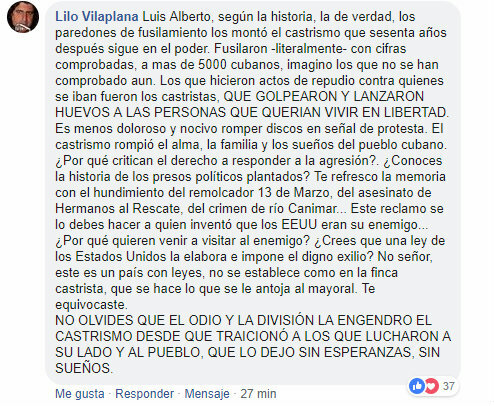 Cuban filmmaker Lilo Villaplana has responded to actor Luis Alberto Garcia, who said on his Facebook wall that after the US announcement to cut from 5 years to 3 months B2 visas to Cubans "those who grow grudges, ask for heads, they take out flakes, dismantle, amass revenges, right and sinister walls, crush Universal and Egrem disks ". The director left a comment below the news posted on the Facebook of CiberCuba, in which he asks the actor of Clandestinos if he believes that the laws of the United States are prepared and dictated by the Cuban exile. "No, sir, this is a country with laws, it is not established as in the Castro farm, which is what the mayoral craves, you were wrong," he said. Lilo Villaplana also reminded Luis Alberto García that the firing walls in La Cabaña "were set by Castro who, sixty years later, is still in power." They fired -literally- with proven numbers of more than 5,000 Cubans. still checked. " The director also added that "those who made acts of repudiation against those who left were the Castroites, who beat and threw eggs at people who wanted to live in freedom." In the opinion of Lilo Villaplana "it is less painful and harmful to break records in protest," he said in reference to statements by Luis Alberto Garcia in which the actor criticizes "that discs of Universal or Egrem are broken" and pleads climb "to the hat and the gun". "Castroism broke the soul, the family and the dreams of the Cuban people, why do they criticize the right to respond to aggression?" Asks Lilo Villaplana. In case Luis Alberto García has forgotten the history of political prisoners, the filmmaker refreshes his memory with the sinking of the tugboat March 13, the murder of the Brothers to the Rescue or the crime of the Canímar River. He also advises the actor to make his claim to who invented that the United States is the enemy. "Why do you want to come visit the enemy?" He remarked. Lilo Villaplana responds to the two posts that Luis Alberto García published on his Facebook wall on Friday in which he defends that it is the ordinary Cubans who lose with the restriction of the B2 visas, which until now were granted for 5 years. price of 160 CUC and this allowed them to enter the United States multiple times. From the next day 18, in reciprocity to what the Government of Cuba does with the Americans, the visas will be of 3 months and will only be valid for a single entry. 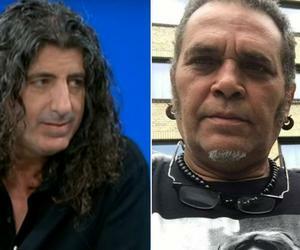 Luis Alberto García received on his Facebook wall criticisms similar to those that Lilo Villaplana left him on the Facebook of CiberCuba Noticias. He defends that with this measure win those who promote hatred from one side and the other. "You give me two months? I give you two and a half, I give you 24 hours? We give you 23. Government trap," the actor wrote, then returned to the charge: "And they won, they lacked more, the ones that aged grudges, they ask for heads, they take out flakes, they dismantle, they amass vengeance, right and sinister walls, they crush disks, of Universal and of the EGREM ". However, before the barrage of comments against, Luis Alberto, somehow apologized: "Forgive me being so stupid and think and manifest me as a great imbecile Thank you I love you more than Alfredito. home".